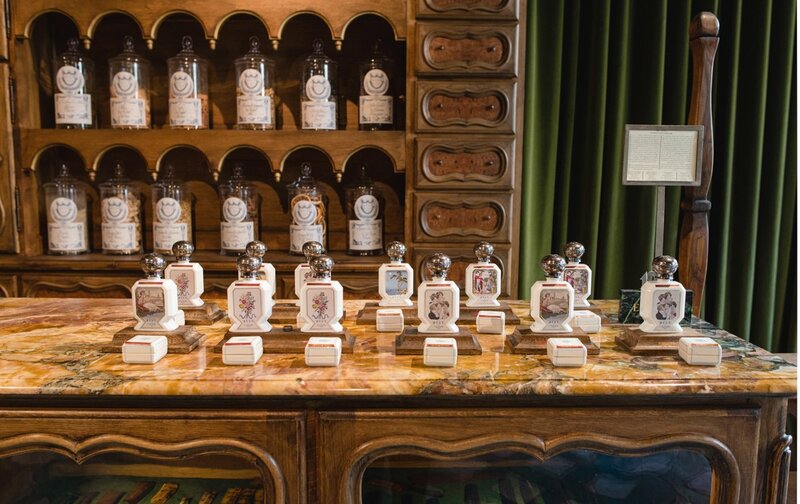 L’Officine Universelle Buly, also known as simply Buly 1803, just might be the most unique cosmetics boutique in all of Paris. Their history, products, philosophy, packaging and store design are unlike anything else I’ve ever seen. 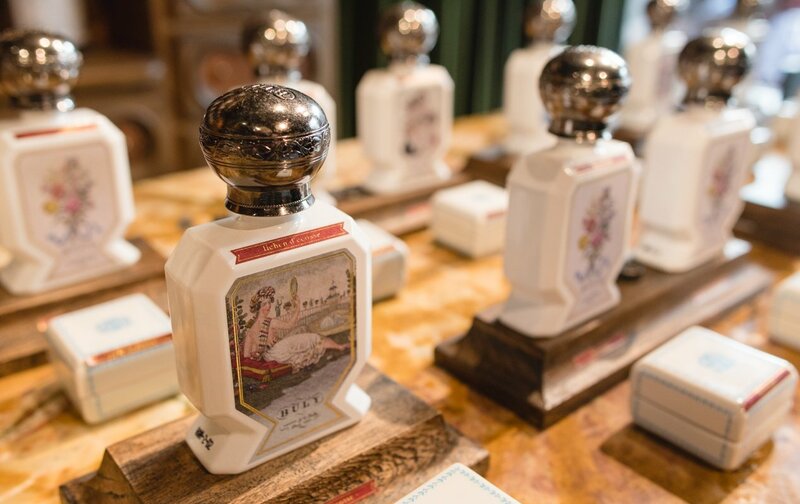 It all began over 200 years ago with a perfumer, distiller and cosmetician named Jean-Vincent Bully. 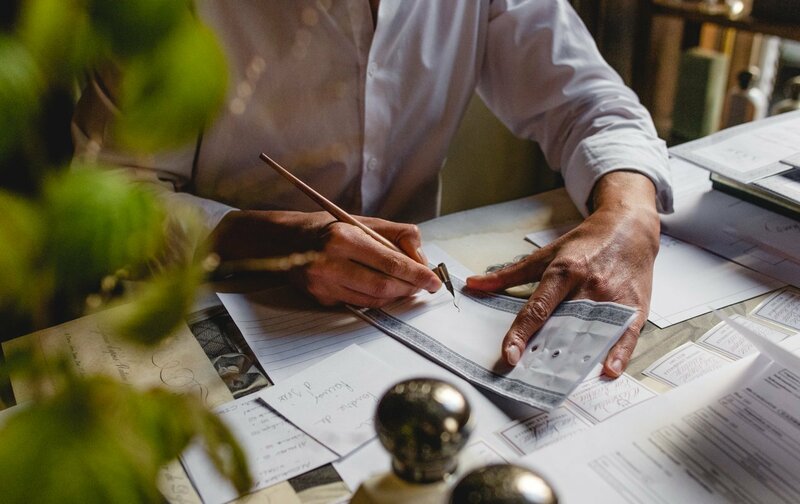 He made a name for himself throughout Europe with his trend-setting formulations during a time when the perfume and cosmetics industry was booming. In fact, he became popular enough to be the inspiration behind one of Balzac’s characters in his Scènes de la Vie Parisienne. For over 100 years, the company enjoyed great notoriety, but eventually faded into nonexistence. That is, until it was picked up again years later (under a different spelling), and revamped into a complete beauty brand focused on naturally sourced ingredients. Walking into their boutique on a quiet, nondescript little street just off of the riverbank, is like stepping back in time. 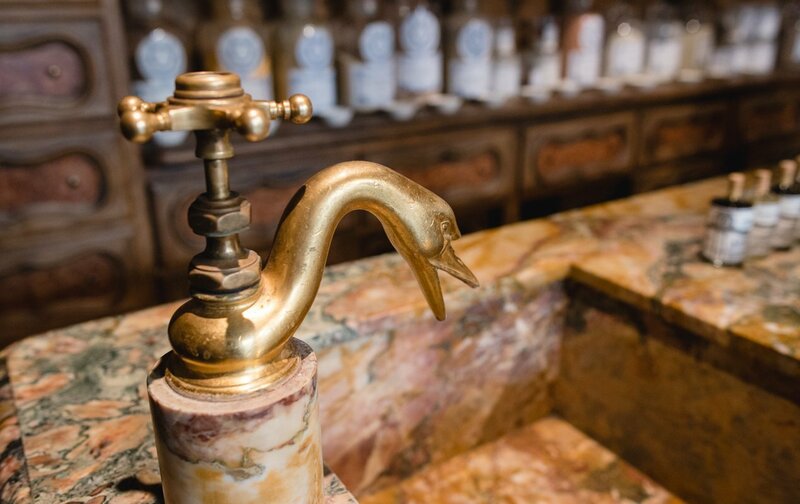 The interiors are inspired by 17th and 18th century apothecaries, with rich wood cabinets, golden marble countertops, and a beautifully worn tile floor. No detail is overlooked here, even the ceiling beams are painted with a floral pattern that was all the rage during the Elizabethan period, and a frosted brass faucet is shaped like a goose. 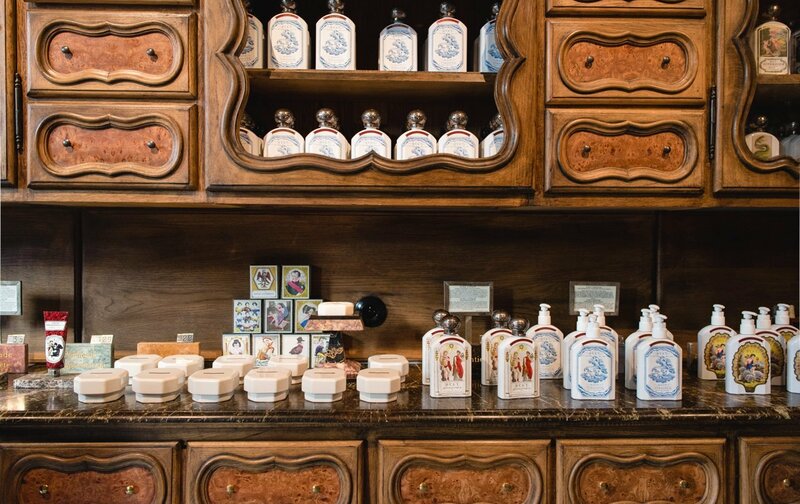 On one counter, you’ll find all their water-based perfumes. 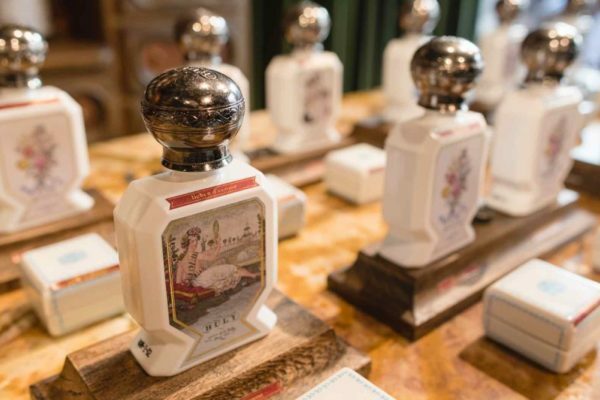 They shy away from alcohol in their fragrances because they feel it is too harsh on the skin and actually degrades the lasting power of the scent itself. On another counter you’ll find vegetable oils made from ingredients from every part of the globe. 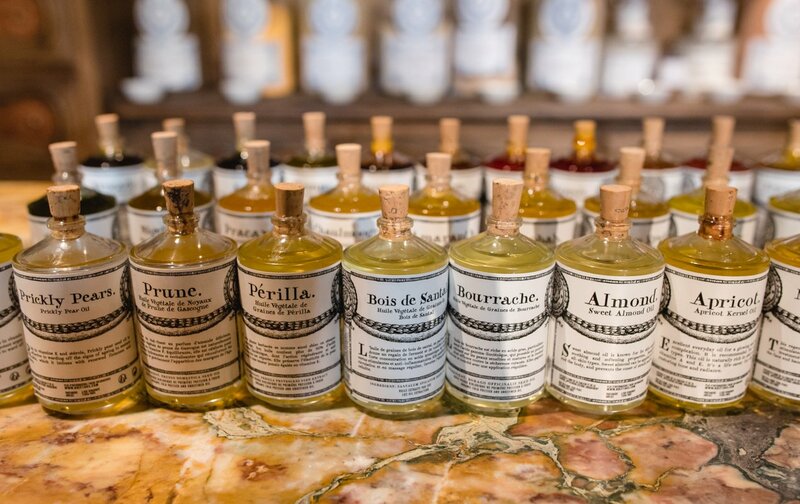 They have common oils like lavender and tea tree, but also more rare, exotic oils like prickly pear and carrot. 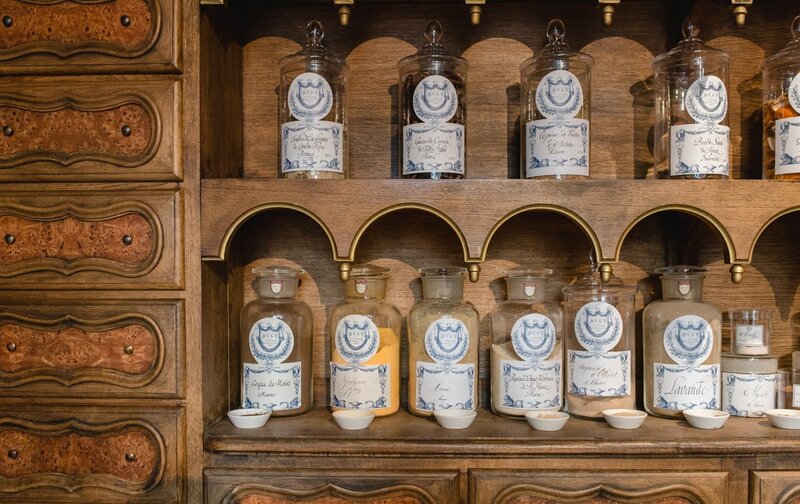 On the wall behind the oils are rows of large glass containers filled with dried ingredients that you can use to concoct facial masks or scrubs. Some of them include Iris Root, pulverized rose petals, and various types of natural clay. The salespeople can give you lots of information regarding the particular benefits of each, and recommend how to use them. For instance, combine their Illite Green Clay with a bit of their Rose Water or Grape Seed Oil (high in Omega-6), and you’ve got yourself an anti-aging facial mask that helps soothe and regulate oily skin. 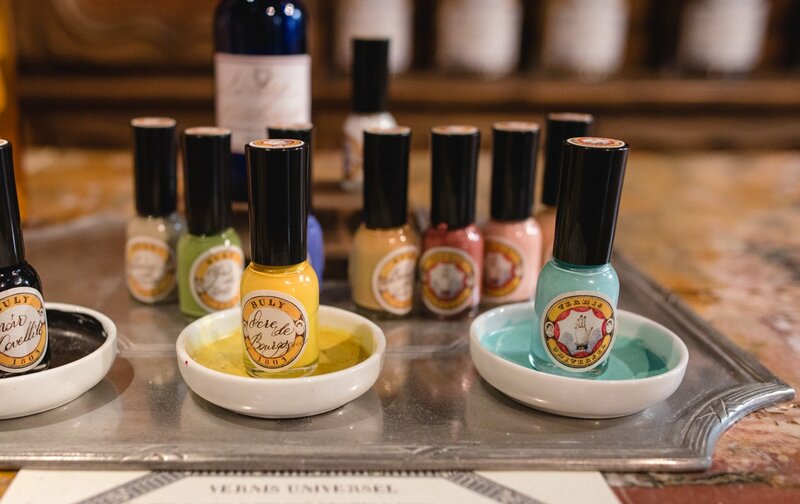 At their beauty counter, you can become your own alchemist! For something simpler, you might be interested in their line of body butters, soaps, facial toners, and even nail polish and toothpaste. Also offered are home fragrances in the form of candles, potpourri or “fragrance stones,” a truly unique method of perfuming a room. 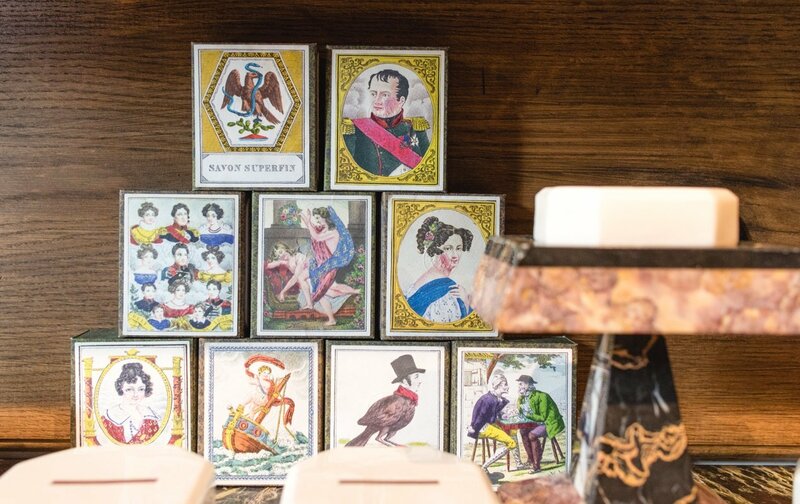 The scent is poured onto a super dense type of stone that is contained inside of a painted porcelain box, allowing you to release or contain the aroma at will. One of the most unique aspects of the shop is their in-house calligrapher, who beautifully scripts your name and product on the packaging of every item you purchase. It’s such a beautiful touch, and you walk out feeling like you have something truly one-of-a-kind and special. It’s also fascinating to watch their skilled hands at work. On top of that, the packaging and labels themselves are a work of art! They’re so delightfully antique and would look stunning displayed on a bathroom counter or vanity. 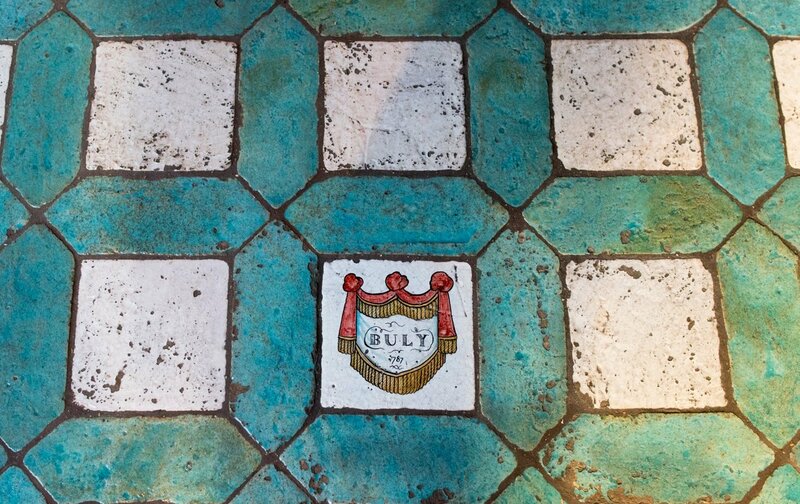 If you’re interested in the world of beauty or cosmetics, you simply cannot miss Buly 1803! 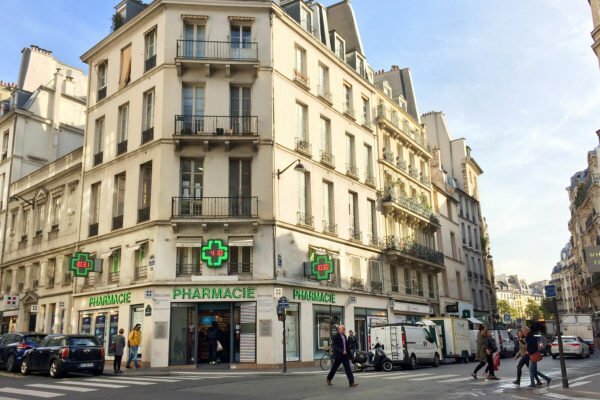 It’s not far from Saint Germain des Près and Saint Michel, so I would highly recommend stopping in when you’re nearby. NEXT: Amazing Savings During Our Black Friday Sale! Posted on Wednesday, November 23rd, 2016 at 10:00 am in Shopping. You can follow any responses to this entry through the RSS 2.0 feed. You can leave a response, or trackback from your own site. 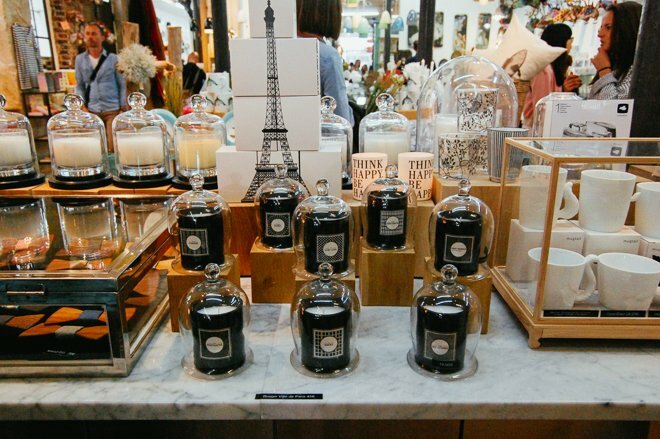 Do you sell candles to USA? Saw them in a fine hotel this June and didn’t have time to buy. We don’t sell candles, but you can contact the shop or go online, probably.